Hi, my name is Alexander Shatalov and I am 3D developer and I am excited to introduce you to my rigging system for Unreal Engine. 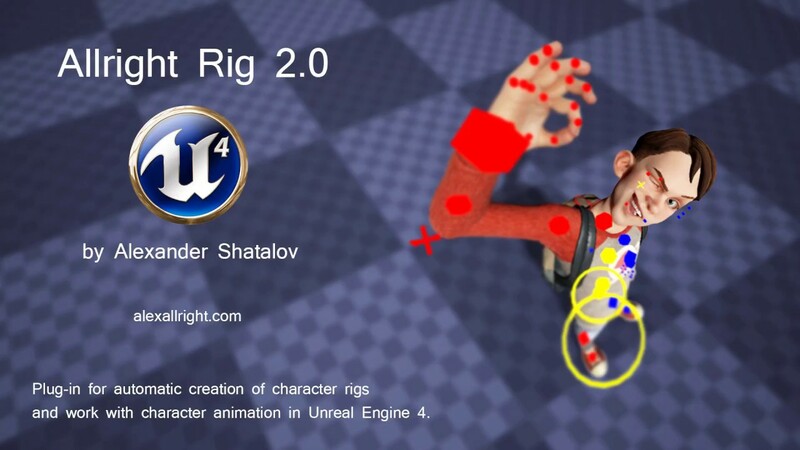 Allright Rig is an expandable nodes and macros library for automatic creation of character rigs and working with character animation in Unreal Engine 4. The main goal is to create a possibility of creation and editing character animation, which will help to make games, previsualization, cinematics and animation movies in Unreal Engine 4. Last edited by Alexallright; 10-25-2018, 01:14 PM. Right now this system is in a demo version. I applied to the Unreal Dev Grants and if I win, I will finish the roadmap as fast as possible and the system will be free. So...can we try out this demo version? Otherwise how can we give you feedback? Just by comment about your YT video? Good question, Sadaleus! Yes, I'm going to make a demo test. To be honest, I'm pretty new to the community and right now I would like to know what do people think about this system. Cool stuff! Would be nice to animate inside UE4 (assuming animations tools will be at least on par with Blender). Looks amazing and great work so far!!! I read your dev grant request page and I hope you get the grant!! but in the sad case that doesn't happen, do you have an idea of how much you plan on asking for this? Thank you! I haven't decided the exact price yet, but i think it will be something like 100 usd for a copy on the market place, and the roadmap will be much shorter in this case. Most part of this roadmap will be done on next releases and updates. Who knows, maybe it is a better way. However, I want it to be accessible for small studios and indie developers.﻿ And also one guy suggested me to try sourcing some funds from the community in a campaign to make it free. However, i have no more possibility to work on this project without money. Thank you! I am going to make them better (with an Epic Games help of course)! However, this system already works and it will continue to grow and expand! Also I want to make a face rigging system for unreal, but it will be another project. Looks great, nice work. Would use. Wow, this looks really very good and super useful. Good luck on the grant! This is the most important plugin I've ever seen. It will make my next project like 20x less tedious and way more enjoyable. I'd pay $100 for this. Also, how do I vote for you to get the grant? Can't seem to figure out how. You deserve it. This is huge. Nice stuff Alexandr, I really am impressed and I love it!! Keep up the great work! I can't wait to see how you progress with it. I'm pleased to see that you really did consider the concept that I mentioned over Facebook regarding bringing it to the community if you can reach a certain amount of funding, I am certain the community will help support that goal. There's nothing better than bringing something like this to the masses! I hope it works out and I'll try to spread the word as best I can as my small contribution to your efforts. It's great to see that you're main goal is finishing with the current features too before trying to get too far ahead of the project, I really hope this goes well and you're able to reach the funding you need to open this up to people for free, if not I am sure it will be a reasonable price all the same. I am actually eagerly waiting to see how this goes haha. Last edited by Patriick; 07-24-2016, 12:24 PM. Currently working on a Steampunk themed 3d puzzle platformer called. The Machine. This plug-in opens up the possibility to use the engine to create full-fledged animated movies. It's just a coup. I look forward to the release. Great job! Thank you very much! You can vote here for the thread and at dev grants thread as well. Thank you! It was a long way, but this system works already and it will only grow!